Viandes Dunham offers portioned, ready-to-cook, top-quality prepared meats. Simply add your personal touch! Hassle-free products, at your fingertips! Since our products are frozen in individual portions, you can easily prepare and serve all the meat dishes on your menu. You no longer have to deal with losses and the management of related products. Customers will enjoy the same portion size, the same texture and the same flavour every single time—pleasure and satisfaction guaranteed! 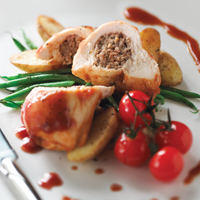 Our meats are already packed with flavour, allowing you to save on labour while offering a superior-quality product.